NDC National executives leading the demonstration. 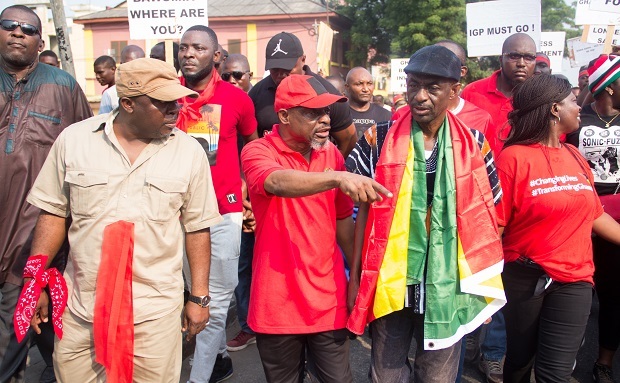 The demonstration, organised by the recently minted grouping, Inter-Party Coalition In Support Of National Sovereignty, wound through some Accra streets and ended up with the leadership presenting a petition to the Minister of the Interior and other heads of institutions. The petition contained critical demands, among them the resignation of the Minister for National Security, Albert Kan-Dapaah; Minister of State in-charge of National Security, Bryan Acheampong and the Inspector General of Police (IGP), David Asante-Apeatu. Bernard Mornah, Chairman of the People’s National Convention (PNC), who relied on the active support of the NDC to put the demonstration together, has a dual loyalty to the aforementioned two political groupings. The organizers of the demonstration claimed that there is a growing trend of violence in the country and demanded an immediate cessation through a government intervention. Clad in red to denote their seriousness, the demonstrators were spurred on by the shooting incident which occurred in a section of the Ayawaso West Wuogon Constituency during the by-election which returned Lydia Seyram Alhassan, the NPP candidate, as the MP. According to the group, the demonstration was to protest the violence which marred the by-elections in the Ayawaso West Wuogon Constituency last Thursday. The group blamed the IGP for losing control of the Ghana Police Service and called for an overhaul of the system. “We also demand an immediate resignation of the Inspector General of Police (IGP), Asante-Apeatu for losing control of the Police Service to the extent that properties and equipment of the police will be used in such a terror operation sanctioned by another security agency with or without his knowledge. “We also demand that the Ghana Police Service be reconstructed to efficiently undertake its sworn mandate to defend the constitution, as it is vested with the people’s power to act in defense of the laws of the state,” he said. The group also called for the immediate arrest of all suspects involved in the violence to face the full rigours of the law. “If the service continues to prove inept at this task and persist in the display of partisan interest, they will have themselves to blame when the moment of reckoning arrives. “We shall stand up for what is right and defend the dignity and honour of the Police Service,” he stressed. The demonstration, which started at the Obra Spot near the Kwame Nkrumah Interchange at 8:30am, went through the Ministry of Interior, Ghana Police Headquarters and ended at the Jubilee House around 1:30pm. At each of these places, the leader of the group, Bernard Mornah, presented a petition to the heads of the institutions.